This proposal constitutes an algorithm of design applying the design for six sigma thinking, tools, and philosophy to software design. The algorithm will also include conceptual design frameworks, mathematical derivation for Six Sigma capability upfront to enable design teams to disregard concepts that are not capable upfront, learning the software development cycle and saving development costs. The uniqueness of this book lies in bringing all those methodologies under the umbrella of design and provide detailed description about how these methods, QFD, DOE, the robust method, FMEA, Design for X, Axiomatic Design, TRIZ can be utilized to help quality improvement in software development, what kinds of different roles those methods play in various stages of design and how to combine those methods to form a comprehensive strategy, a design algorithm, to tackle any quality issues in the design stage. 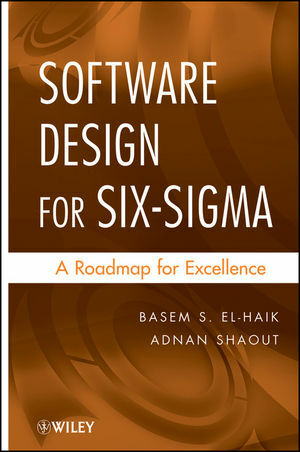 BASEM S. EL-HAIK, PhD, is the CEO and President of Six Sigma Professionals, Inc. (www.SixSigmaPI.com) and an author of many bestselling books on the subject of DFSS and Six Sigma. Dr. El-Haik holds a PhD in Industrial Engineering from Wayne State University and a Doctorate of Manufacturing Engineering from University of MichiganAnn Arbor. He is a well-known figure in the robust design, reliability engineering, simulation, software engineering, Computer-Aided Robust Design (CARD), Computer-Aided Reliability (CAR), and DFSS for product, service, and process arenas. ADNAN SHAOUT is Professor in the Electrical and Computer Engineering Department and Director for the Software Engineering Master Degree Program at the University of MichiganDearborn. 1.2 Quality, Customer Needs, and Functions. 1.3 Quality, Time to Market, and Productivity. 1.5 Software Quality Assurance and Strategies. 2 TRADITIONAL SOFTWARE DEVELOPMENT PROCESSES. 2.2 Why Software Developmental Processes? 2.4 Software Development Processes Classification. 3 DESIGN PROCESS OF REAL-TIME OPERATING SYSTEMS (RTOS). 3.2 RTOS Hard versus Soft Real-Time Systems. 3.4 Task Scheduling: Scheduling Algorithms. 3.5 Intertask Communication and Resource Sharing. 4 SOFTWARE DESIGN METHODS AND REPRESENTATIONS. 4.2 History of Software Design Methods. 5 DESIGN FOR SIX SIGMA (DFSS) SOFTWARE MEASUREMENT AND METRICS. 5.6 Software Development Process Metrics. 6 STATISTICAL TECHNIQUES IN SOFTWARE SIX SIGMA AND DESIGN FOR SIX SIGMA (DFSS). 6.5 A Note on Normal Distribution and Normality Assumption. 7.3 What is Six Sigma? 7.4 Introduction to Six Sigma Process Modeling. 7.5 Introduction to Business Process Management. 7.6 Six Sigma Measurement Systems Analysis. 7.7 Process Capability and Six Sigma Process Performance. 7.8 Overview of Six Sigma Improvement (DMAIC). 7.9 DMAIC Six Sigma Tools. 7.11 Six Sigma Goes Upstream—Design For Six Sigma. 8 INTRODUCTION TO SOFTWARE DESIGN FOR SIX SIGMA (DFSS). 8.2 Why Software Design for Six Sigma? 8.3 What is Software Design For Six Sigma? 8.4 Software DFSS: The ICOV Process. 8.5 Software DFSS: The ICOV Process In Software Development. 8.7 A Review of Sample DFSS Tools by ICOV Phase. 8.A.1 Appendix 8.A (Shenvi, 2008). 9 SOFTWARE DESIGN FOR SIX SIGMA (DFSS): A PRACTICAL GUIDE FOR SUCCESSFUL DEPLOYMENT. 9.2 Software Six Sigma Deployment. 9.3 Software DFSS Deployment Phases. 9.4 Black Belt and DFSS Team: Cultural Change. 10 DESIGN FOR SIX SIGMA (DFSS) TEAM AND TEAM SOFTWARE PROCESS (TSP). 10.2 The Personal Software Process (PSP). 10.3 The Team Software Process (TSP). 10.4 PSP and TSP Deployment Example. 10.5 The Relation of Six Sigma to CMMI/PSP/TSP for Software. 11 SOFTWARE DESIGN FOR SIX SIGMA (DFSS) PROJECT ROAD MAP. 11.2 Software Design For Six Sigma Team. 11.3 Software Design For Six Sigma Road Map. 12 SOFTWARE QUALITY FUNCTION DEPLOYMENT. 12.6 HOQ 1: The Customer's House. 12.8 QFD HOQ 2: Translation House. 13 AXIOMATIC DESIGN IN SOFTWARE DESIGN FOR SIX SIGMA (DFSS). 13.2 Axiomatic Design in Product DFSS: An Introduction. 13.3 Axiom 1 in Software DFSS. 13.5 Axiom 2 in Software DFSS. 14 SOFTWARE DESIGN FOR X. 14.2 Software Reliability and Design For Reliability. 14.4 Software Design for Testability. 15 SOFTWARE DESIGN FOR SIX SIGMA (DFSS) RISK MANAGEMENT PROCESS. 15.2 Planning for Risk Management Activities in Design and Development. 15.3 Software Risk Assessment Techniques. 15.7 Software Risk Management Roles and Responsibilities. 16 SOFTWARE FAILURE MODE AND EFFECT ANALYSIS (SFMEA). 16.2 FMEA: A Historical Sketch. 16.4 Software Quality Control and Quality Assurance. 17.3 Comparing Software Optimization Metrics. 17.5 Synchronization and Deadlock Handling. 18 ROBUST DESIGN FOR SOFTWARE DEVELOPMENT. 18.3 Robust Design Concept #1: Output Classification. 18.4 Robust Design Concept #2: Quality Loss Function. 18.5 Robust Design Concept #3: Signal, Noise, and Control Factors. 18.6 Robustness Concept #4: Signal–to-Noise Ratios. 18.7 Robustness Concept #5: Orthogonal Arrays. 18.8 Robustness Concept #6: Parameter Design Analysis. 18.9 Robust Design Case Study No. 1: Streamlining of Debugging Software Using an Orthogonal Array. 18.A.1 ANOVA Steps For Two Factors Completely Randomized Experiment. 19 SOFTWARE DESIGN VERIFICATION AND VALIDATION. 19.2 The State of V&V Tools for Software DFSS Process. 19.3 Integrating Design Process with Validation/Verification Process. 19.4 Validation and Verification Methods. 19.5 Basic Functional Verification Strategy. 19.6 Comparison of Commercially Available Verification and Validation Tools.